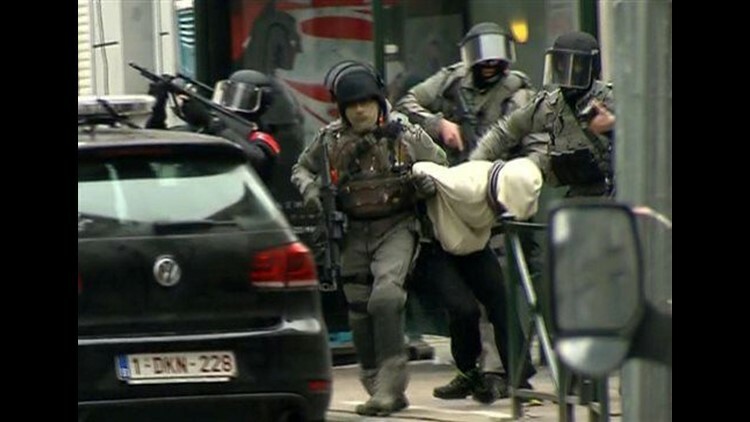 BRUSSELS (AP) — Salah Abdeslam, the top suspect in last year's Paris attacks, was charged with "terrorist murder" on Saturday by Belgian authorities and his lawyer vowed to fight any attempt to extradite him to France to stand trial for the slaughter of 130 people. "I can tell you that he is collaborating with Belgian justice and that we will refuse the extradition to France," said Sven Mary, Abdeslam's lawyer. He said Abdeslam met with a Belgian investigating magistrate Saturday but had to be questioned lying down due to his leg wound. Abdeslam, Brussels native, is accused of playing a key role in the deadly Nov. 13 attacks on a rock concert, cafes and a stadium that left Paris reeling. Mary told The Associated Press that Abdeslam "doesn't deny he was in Paris." In an initial step which may see him extradited to France later, Belgium authorities on Saturday officially charged him and an alleged accomplice who has used two aliases "with participation in terrorist murder" and in "the activities of a terrorist organization." Bernard Cazeneuve, the French interior minister, said he hopes Abdeslam can be brought to France to face justice. He spoke after French President Francois Hollande held an emergency security meeting in Paris. Hollande has warned that more arrests will come as authorities try to dismantle a network involved in the attacks, which authorities say is much larger than originally suspected. Islamic State claimed responsibility for the Paris carnage. Cazeneuve called Abdeslam's arrest a "major blow" to the Islamic State group in Europe, but warned the threat of new attacks remains "extremely high." Abdeslam will now have to appear before a pretrial court, which will decide whether he stays in jail for up to another month. "If he starts talking, then I presume it will mean he stays longer in Belgium," federal prosecutor Eric Van der Sypt told the AP. But whether he fights extradition or not, "sooner or later he will be extradited to France." Belgian Prime Minister Charles Michel told a news conference Saturday that his government has no "political objection" to handing Abdeslam over to the French, but wants to fully respect Belgian judicial procedures, which "can take at least a couple of weeks." Michel declared "the fight is not over" against terrorism. Two other people believed linked to the attacks are still being sought, including fellow Molenbeek resident Mohamed Abrini and a man known under the alias of Soufiane Kayal. French and Belgian anti-terrorism prosecutors had planned a teleconference call Saturday to discuss Abdeslam's extradition, among other items. Hollande said Friday he was sure "the French judicial authorities will send an extradition request very soon" and that "the Belgian authorities will answer it as favorably as possible, as soon as possible." Abdeslam is a childhood friend of the suspected ringleader of the Paris attacks. Investigators believe Abdeslam drove a car carrying gunmen who took part in the shootings, rented rooms for them and shopped for detonators. Most of the Paris attackers died on the night of the attacks, including Abdeslam's brother Brahim, who blew himself up. After the bloodbath, Salah Abdeslam evaded a dragnet to return to Brussels. He was believed to have slipped through police fingers multiple times despite an international manhunt. Abdeslam and four other suspects were detained in Friday's raid, including three members of a family that sheltered him. Abdeslam was not armed but did not immediately obey orders when confronted by police, Van der Sypt said. Belgian prosecutors said they were not sure of the identity of the presumed accomplice arrested with Abdeslam. They said he is believed to have used fake Syrian and Belgian documents in two different names. It was possible that Abdeslam had spent weeks or even months in the Molenbeek apartment, according to Van der Sypt. Abdeslam's exact role in the attacks has never been clearly spelled out. The car he drove was abandoned in northern Paris, and his mobile phone and an explosive vest he may have had were later found in the Paris suburb of Montrouge, raising the possibility that he had aborted his mission. Samia Maktouf, a French lawyer for several survivors and relatives of the Paris attack victims, urged an immediate extradition for him. For her clients, "relief is mingled with bitterness" because some suspects are still on the run and belong to a sprawling, organized terror network that has yet to be stopped, Maktouf said. "Our young people found death for no reason. Today, their families have empty chairs next to them, they have a phone that doesn't ring any longer," she said. Sotto reported from Paris. Raf Casert in Brussels and Sylvie Corbet in Paris assisted.